CentiLeo 0.54 for 3ds Max 2014-2018 is ready! Quality becomes better! Bump is much better, however the majority of time was spent on glass+liquid correct IOR handling. [cntlmax] Fixed various cntlLight bugs (bad GUI when create several lights, not working size of rollout, wrong radius export for spot and sphere shapes). [cntlmax] Fixed crashing bugs in cntlProxy when input non ”.cntlproxy” files. [cntlmax] Fixed some export bugs for instancing and Max Compound Scatter objects. [cntlmax] Fixed IPR bugs not receiving keyboard input for post processing controls. Thanks for the new build! I haven´t had the time to try it out. Just a thought, I think it would be a good thing to be able to increase the motion blur time to more than a frame. unrealistic but useful for fake time-slice etc. There will be another dive into motion blur area to get more flexibility out of it including more motion keys (and variable) and extending time, etc. But this is expected after work on completelly missing "must-have" features. Hi, I decided to try and follow CentiLeo.First of all, I wish you to continue to develop successfully it and i think forum needs to requests section. i want to some requests for examples; LUT,bloom,glare on settings. You may freely open a topic for requests in this forum section (about 3ds max) or in "Development progress" section. Btw, there is a plan for the nearest version updates, see here http://centileo.com/forum/forum21/ It includes some complex features / improvements that can influence the core engineering. After we finish it that there will be a so called vacation: quick run on easy to do features like LUTs, AOVs, proxies, more camera options, physical sky, glare/bloom, material converters and more. Hi Blake and welcome to CentiLeo page! The documentation is very old already. Displacement was deactivated at some point due to many bugs. I am currently working on a new displacement implementation just for the next release, it will be better and faster. The documentation will be updated few releases later. Have I missed something? I cant see how to rotate bitmaps in material editor.. Very annoying to have to either reedit the image or rotate the uvw mapping on the geometry. I will fix that soon! Thanks. Also the shadowcatcher only works when the background override is on, set to higher than 0. Otherwise I cant get an alpha channel. Also it would be great if the secondary light of the matte object was optionaly reflected. Hi Daniel, I will double-check it again for zero values. Maybe it considers that with values 0.00001 the background override is working but it's black as with zero (almost black). You can switch off the secondary illumination of shadow catcher object if you switch on the shadow catcher checkbox and swicth off reflections. This way it will show just the background and shadows, but will ignore reflections (that are on by default). I think I had the earlier version... Sorry. No problem in 0.541. Is there a way to animate the focus distance? Let me check the focus distance issue and fix. The next version is always soon, but still fixing few new issues. Hi here is four renders that point out some issues with the shadowcatcher I think. Looking forward to the next alpha..
Hi Daniel! Here shadow catcher works as designed in all images. 1. There is a green (green?) diffuse material + some reflection and you see the GI reflected from it and visible by camera. 2. When you turn on shadow catcher then it replaces the diffuse color with the color of environment map for the current context (i.e. for primary visibility this is env map for camera, for reflected rays it is env map for reflection, etc.) In your example the environment map is black, that's why diffuse color of shadow catcher material is black too. 3. And when you turn off reflections then the ground plane become black entirelly: no reflections and black diffuse (because black bacground). You may get the picture of shadows if you make the environment map not black (green, white or anything you like) and enable Alpha channel in AOVs rollout. If you enable it you will be able to get Beauty and Alpha without background picture but with all that shadow casts (with white alpha for shadows and black alpha for lit regions). Returning to picture 1 - you want' to collect the picture of green GI? But it's green because the ground diffuse is green (and light is white) - right? If we want the shadow catcher picture to be green too, then need to enable it and make green background but switch if off from visibility in AOVs rollout (somewhere in the top of menu - dont' remember correctly, I am writting from memory). As for SSS - then it needs currently under development displacement and some other polishing, eg. SSS sets where we could assing some numbers to objects or materials and compute shared SSS influence for objects/materials with same SSS set number. Current new version development is going very well, but it required to make things that were planned for more distant future, that's why it's goibg longer then we want. 5.png - changed shadow intensity by light source (inside shadow catcher materials). Those shadow intensities are relative to each other. The higher the "shadow catcher" value of the light source the stronger the shadow. I think we need more flexible AOV funtionality to collect various portions of image and various GI/reflection/refraction subimages. Thanks and sorry for my late response. I still think it would be a good Idea to be able to set the color of the shadow catcher by hand and not always relate to the background image. I think Daniel wants exactly what I told you about. Functionality like Cinema 4d shadow catcher has. As you can see on my screenshot Shadow catcher material has checkerboard texture in background reflection channel, shadow strength and color and reflection options. So this checkerboard reflects in the sphere above, as well as sphere reflects in the floor with shadowcatcher material. Evgeniy, the example from Cinema that you show presents a little bit different from what I understand as shadow catcher. In your example there are different material properties for reflection rays, camera rays and shadow casts. E.g. reflection rays from sphere see the checker that is not seen from camera directly). I think it's a little bit different functionality from shadow catcher. Usually what you have shown is called RaySwitch material (e.g. 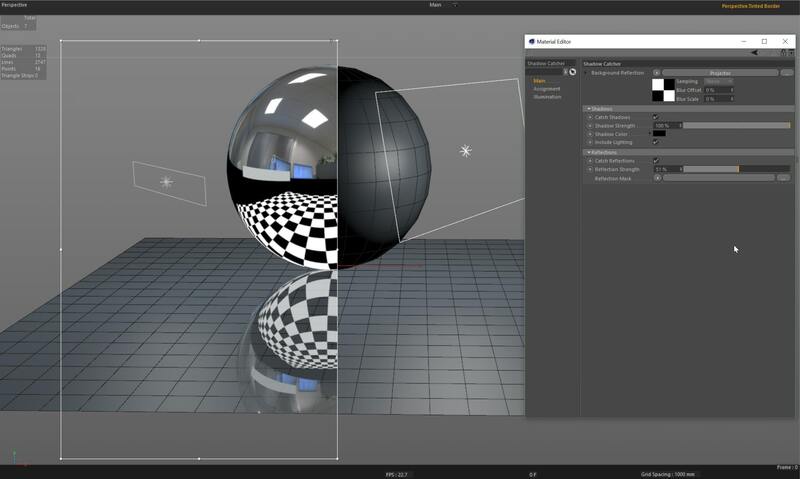 in Corona) where you assign different materials for Camera, Reflection, Diffuse, Refraction, etc. rays. And there are also some features that implement exclusion of some 3D objects from reflections or camera or shadow casts from other objects. With all this flexibility and based on physical light transport under some constraints you may implement many interesting solutions. And it's possible to add these things to CentiLeo in the future. What I understand as shadow catcher is a different thing a little bit. It is a tool to add 3D computer graphics objects inside a photo. And the essential thing is to draw shadows casted by CG objects onto the ground in the photo. You usually make a plane (or some more complex object) and place objects on top of it, enable shadow catcher and there you get shadows without additional illumination on the photo. Howefer, I think we can make the option to light source to add lighting on the photo (to the region with shadow catcher material). And it's also possible to make shadow catcher for alpha-channel only: on beauty it renders without background color on the plane but in alpha channel it still draws the shadows. What do you think about that? Hi, I think the matte material/object properties in Vray is the most versatile. I mainly use object settings in Vray for matte planes I´m not that concerned about shadow catcher but this, for some reason, is always why I have to go back to cpu renderers like Vray. I think that as soon as we can set some basic object properties in Centileo it wont be a big problem. The RaySwitch material seems nice! I have added to TODO list: object visibility properties, ray switch (material/shader), improve shadow catcher with more props. I hope to do next release in a week, but we will see how things work. Right now there is a need to reduce huge counts of tesselated micropolygons. Other things are in a good shape now.